It’s funny how things turn out. John Rylands was born in St Helens, Lancashire, in 1801 and helped to create what was at one time the biggest textile company in the UK. At its peak, John Rylands & Sons employed 15,000 people, mainly across North West England in and around Wigan, Bolton and Manchester, in 17 mills, factories and warehouses. He was known as the Cotton King. 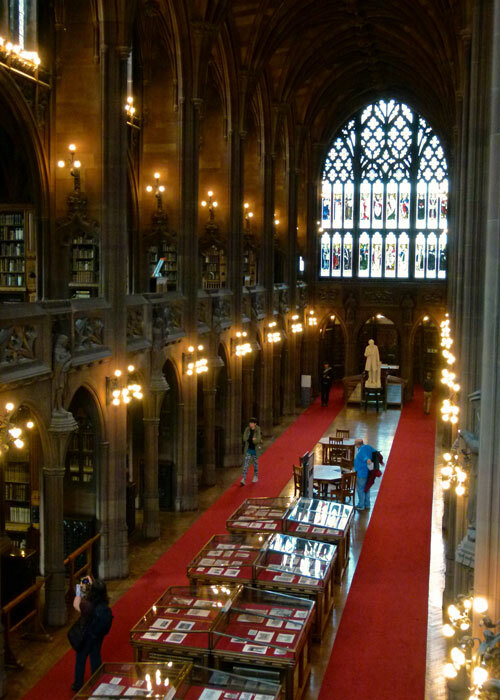 As well as being an astute and highly successful businessman, Rylands was a shy, but generous, philanthropist; yet he is chiefly remembered now for the internationally renowned library in Manchester that bears his name, founded in his memory by his widow. Rylands’ legacy was also dictated by events in his personal life that no one could have anticipated. His first wife, Dinah, died in 1843 after 18 years of marriage; tragically, all of their six children also predeceased their father. JR was married to his second wife, Martha, for 27 years from 1848 until her death in 1875. His third, and final, wife was Enriqueta Augustina Tennant, who had been Martha’s companion. Born in Havana the same year that Rylands’ first wife died, Enriqueta was 32 and unemployed when she married the 74 year old tycoon just a few months after her former boss had expired. Clearly, they felt there was no time to waste; and only a mean old cynic would suggest this was anything other than a love-match (“So, Enriqueta, what was it, exactly, that made you marry the fabulously wealthy John Rylands?”). The happy couple spent a further 13 blissful years together until John passed peacefully away in 1888, aged 87 years, at home in Longford Hall, the house he had built in his modest 63-acre estate in Stretford. John Rylands’ fortune was worth more than £2.5 million – an astonishing amount in those days – and most of it was left to his widow. You could have forgiven Enriqueta for running off with the cash and letting her hair down in Biarritz or somewhere. But what she actually did was lavish £224,086 of her inheritance building the now world-famous library in memory of her husband. It was designed by Basil Champneys in 1889 (apparently with input from the strong-willed Enriqueta) and took 10 years to construct, running three times over budget. I suspect some of those client changes that contractors love so much, don’t you? The library was dedicated to the public on 6th October 1899 – the Rylands’ wedding anniversary – and finally opened on 1st January 1900. 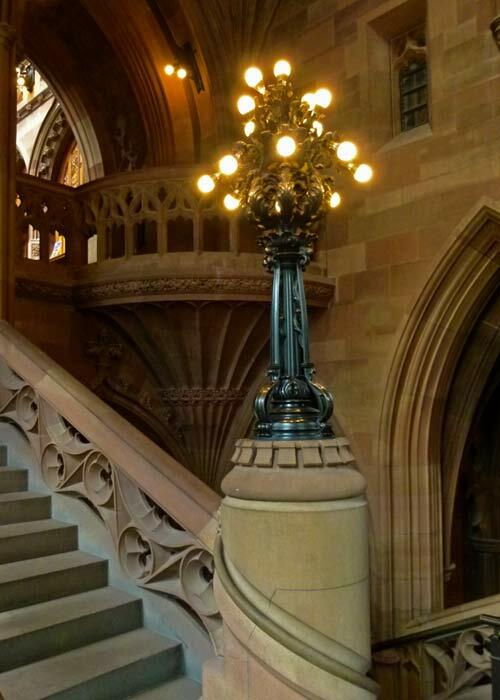 The John Rylands Library was one of the first public buildings to have electricity and is built of pink and red Cumbrian sandstone in loud Victorian Gothic style. Personally, I find the outside clumsy and reminiscent of something from a bad horror movie; but, internally, it is exquisite, with a graceful staircase, soaring arches and beautiful features everywhere you look. It is, in fact, a work of art. The reading room is a particular joy; it is like being in the nave of a bibliographic cathedral, with an upper gallery and statuettes of notable religious figures, philosophers and others – including, appropriately, the printers, Caxton and Gutenberg – running around the edge. 40 feet overhead is a magnificent vaulted ceiling. At either end are two enormous stained glass windows. 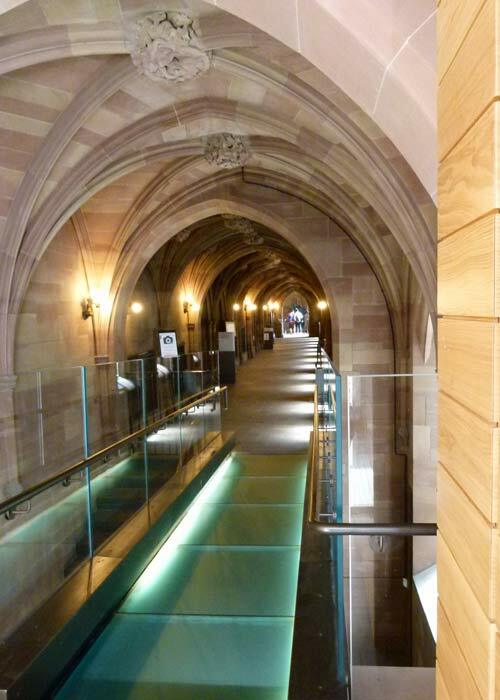 John Rylands Library is a good reason to visit Manchester – it is one of the city’s most popular visitor attractions– and I can’t decide whether or not that fact should surprise us. 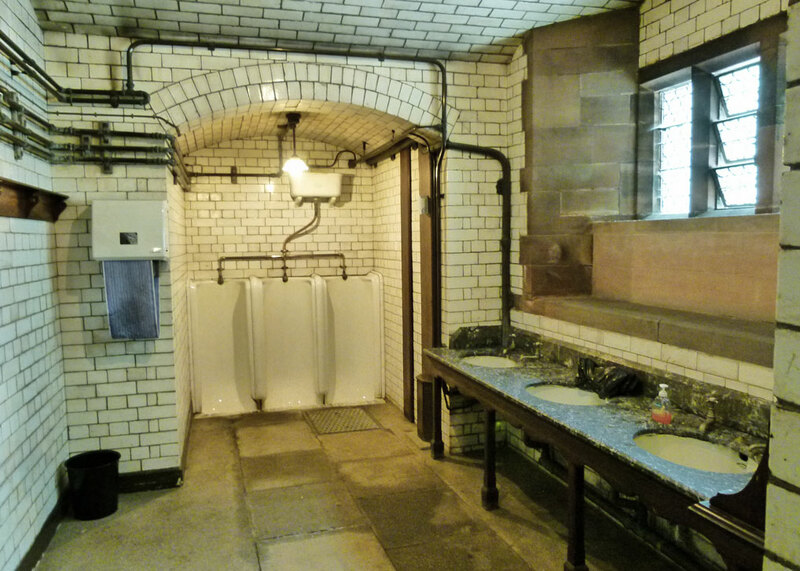 Even the toilets are worth a look – the cubicles in the ladies, apparently, being of dimensions large enough to accommodate Victorian bustles. The mind boggles; plenty of room for manoeuvre in the loo must have been quite a design consideration and, even now, it’s nice to have enough space to stretch out, practice your origami and use your mobile ‘phone, isn’t it? The library was extended in the 1920s, 1960s and, more recently between 2003-07 when £17 million was spent creating a new public reception, shop, café and additional storage for the collections, as well as refurbishing the original building. They’ve pulled off a neat merger of the old and new, and the shop actually sells interesting and fun things you might want to buy. Enriqueta originally intended to create a large public theological library, but that changed when she purchased the Althorp Library, or Spencer Collection, from the 5th Earl Spencer of Althorp in 1892 for £210,000. This unique collection of 40,000 volumes includes many rare items, including a Gutenberg Bible printed around 1455; in fact, the Spencer Collection contains about 3,000 books printed before 1501. In 1901, Enriqueta paid a further £155,000 for a collection of more than 6,000 manuscripts in some 50 different languages from the Earls of Crawford. This was just the start; the acquisitions continue to this day. 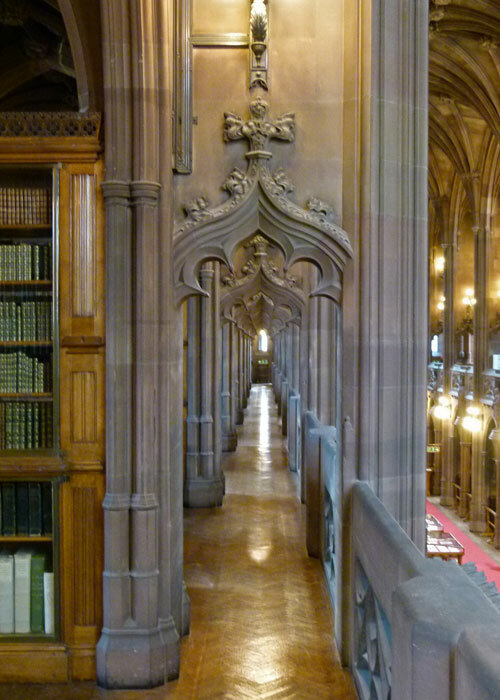 Now, the John Rylands Library is part of the University of Manchester and holds the University’s special collection of early printed books, manuscripts and other precious items – 250,000 printed volumes and about a million manuscripts and archives. It holds the personal papers of a number of famous people and writers, including Elizabeth Gaskell and John Wesley. Among the irreplaceable fragments of papyrus held in the library’s collection is the St John’s Fragment – also known as Papyrus P52 – a tiny part of a New Testament Gospel measuring 3½ inches x 2½ inches (6 x 9 centimetres) written in Greek in the 2nd century AD. The earliest piece of text is a fragment of the Epic of Gilgamesh, the oldest known work of literature in the world, written on a clay tablet about 5,000 years ago. Enriqueta died in 1908, in Torquay. 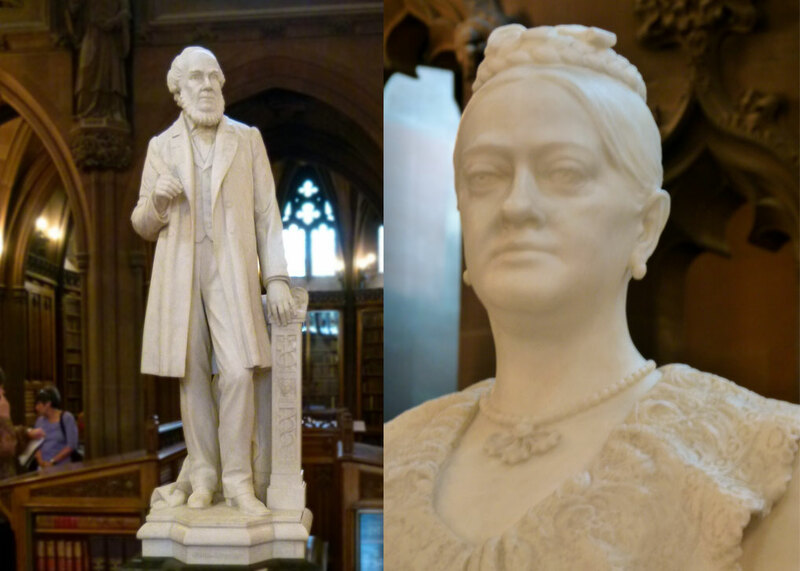 Her remains were interred with those of her husband in Manchester’s Southern Cemetery and their statues gaze at each other from either end of the fabulous reading room at John Rylands Library. Manchester owes Enriqueta Rylands big time for the inspiration and resolve which gave the city such a wonderful building and collection. Interestingly, she left more in her will than she inherited from her husband. 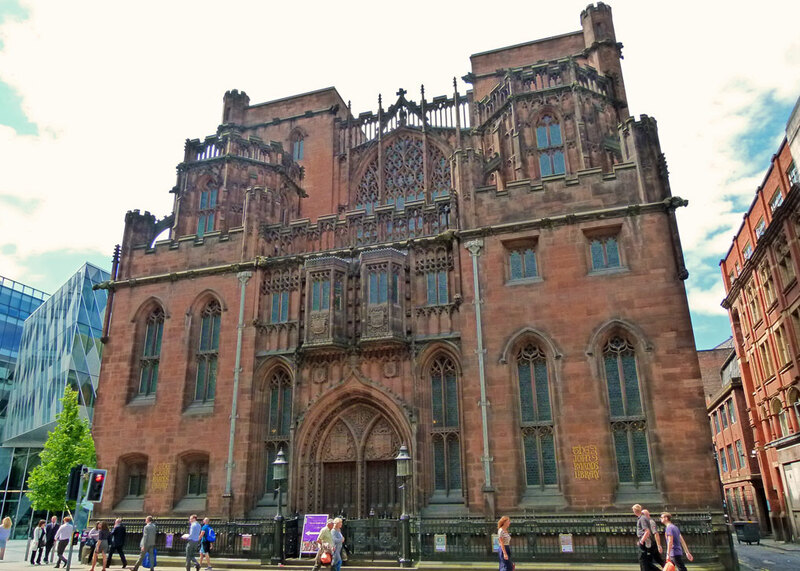 The firm John Rylands & Sons was taken over by Great Universal Stores in 1953 and ceased trading in 1971. It’s funny how things turn out. What an amazing place and resource. 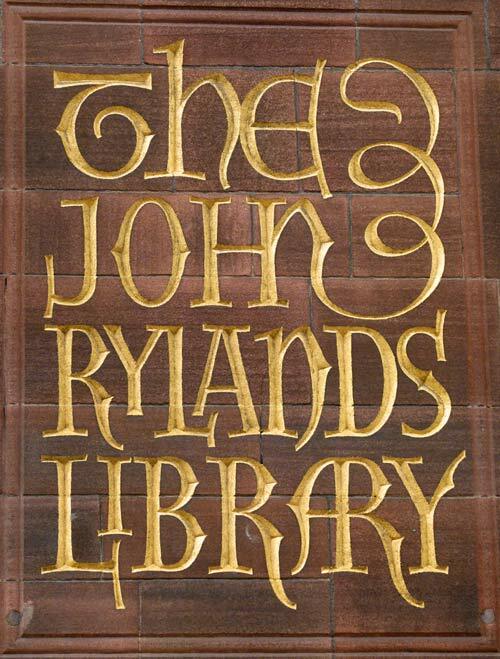 I have often heard about the renowned Rylands Library John’s Gospel fragment. Wonderful to be able to see it here. Your details are impressive as usual. Thanks. What a wonderful looking building, and the hallway inside is just amazing. Thanks for another great post Mike. It does indeed look like a film set for the Addams Family from the outside, but “stunning” is the right word to describe the inside of the building. I must admit I have not paid any attention to it the one time I visited Manchester for more than just pasing through on the train, on my way to and from the airport every year. I have tried to comment several times…so let’s hope this one gets through. I would have loved to be able to study there…how could you not do well. Sorry you’ve had a problem – don’t know why that should be – is it because it’s uphill? Drop me a line if it happens again. What a wonderful story behind this magnificent library. I have a similar story about a woman who married an older man and she was the main reason that a beautiful gorge was saved here in Georgia. If I can get my thoughts together, I will tell you about her! I have a tatty Penguin Classic edition of the Epic of Gilgamesh, but I’m guessing it’s probably worth about 5p. 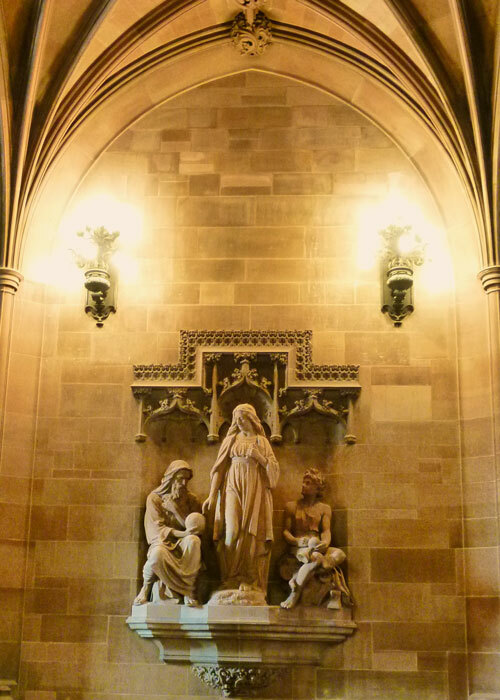 Worshipping books, that is what I was thinking of when I saw the cathedral-like photo! This is fantastic! What a memorial! That hallway looks quite narrow, unless it’s a trick of the camera. An interesting place! Being a mancunian I have visited the library on a couple of occasions. It is a magnificent building that blew me away on my first visit. I don’t recall the Ladies’ toilet being that large though. I can’t remember where I picked up that snippet about toilet design, but I guess it makes sense in the context of the times. Modern clothing has probably allowed them to increase capacity since then! I enjoyed this, Mike. Did John and Enriqueta have any children? I think visiting the bathroom would be fun. LOL In America we have these silly outdoor toilets called Port a Potty’s … they are gross! I absolutely hate them. They are so small. They are found at out door functions and used for overflow at State Parks and such. An imposing looking building on the outside, but quite beautiful inside. I don’t think I have ever seen such a lovely library. I could spend days in there, it’s gorgeous. Love the historical account about John and Enriqueta. What an absolutely beautiful place to visit. I enjoyed reading about it’s history and have marked it as another place I’d love to see. WOW – as a retired librarian, this was a great article. Thank you. Hmm. I was thinking of Elizabeth Gaskell and ‘North And South’ as I read this. My mind keeps wandering to Mr. Thornton. ANYway, what a gorgeous building. Enriqueta did well to spend her money on it rather than on, say, zillions of pairs of shoes – as some do. Did John and Enriqueta have any children? By all accounts she was a generous lady. I believe John and Enriqueta adopted two children. I also thought of John Thornton! The cotton mill.